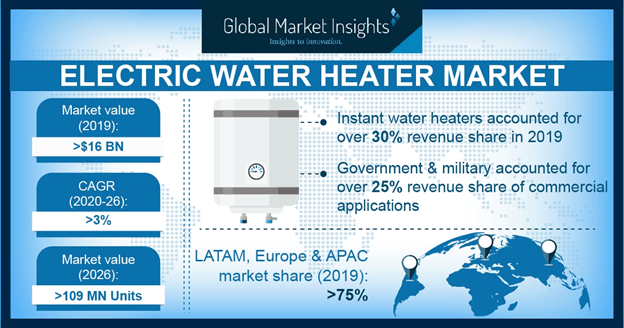 Electric Water Heater Market size was valued over USD 16 billion in 2017 and the annual installation is predicted to exceed 100 million units by 2024. Ongoing government investment toward the expansion of commercial building infrastructure will fuel the electric water heater market. Increasing number of smart city projects along with development of standardized design and engineering codes for electrical appliances will augment the business landscape. Rising hot water demand on account of growing population along with escalating urbanization rate across the world will augment the business landscape. Stringent government norms toward the adoption of energy efficient heating systems along with ongoing measures toward refurbishment of existing electrical appliances will drive the electric water heater market growth. Significant investment by leading industry players toward research and development along with rising competition on product differentiation will augment the industry landscape. 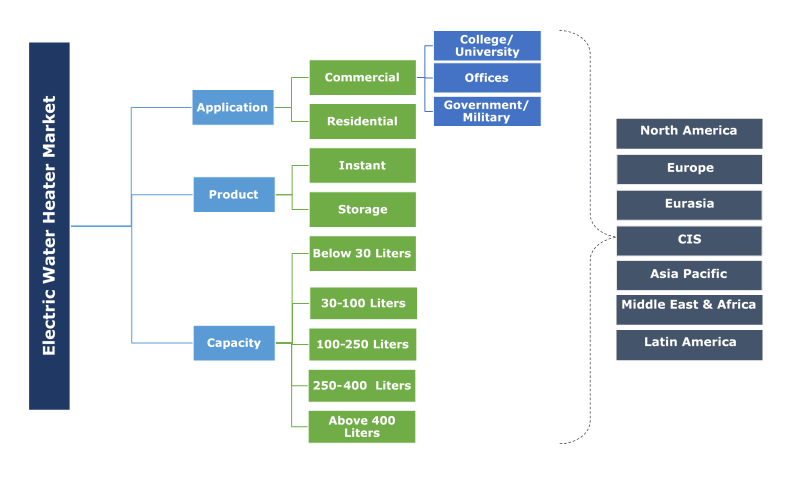 Low maintenance and upfront cost along with flexibility of deployment with the existing electricity infrastructure will drive the storage water heater market size. Simple designs along with user friendly interface make the product acceptable for a wide range domestic application. In addition, higher energy factor in comparison available counterparts will further stimulate the product demand. Growing consumer measures toward the adoption of energy efficient and low power consuming appliances will foster the instant water heater market growth. High heating output, energy efficiency and point of use application are some of the will positively impact the industry outlook. The heaters are best suited for on demand application owing to their easy integration near the demand centers. Low piping cost and heat loss will further stimulate the product penetration. Rising disposable income coupled with significant improvement in the living standards will instigate the demand for low capacity water heaters. Growing development and construction of residential establishments will boost the product adoption. In addition, availability in multiple designs and a wide range of capacities will further encourage the product penetration. Upgradation of conventional heating systems in order to minimize the standby loss and reduce energy bills will foster the 100-250 liters water heaters market growth. Government mandates toward replacement existing heating appliances along with adoption of energy efficient appliances across hotels and government buildings will complement the business landscape. Ongoing government mandates toward the deployment of sustainable heating systems across households will fuel the residential water heater market growth. Rapid advancement in technology and product differentiation offer multiple management and control features for the consumers. In addition, low operation cost coupled with easy maintenance and repair will enhance the business outlook. Increasing investment toward development and construction of educational institutions along with expansion of service sector will accelerate the commercial water heater market. Rising instant hot water requirement across offices and government buildings will facilitate the product adoption. Furthermore, mass flow requirement across hospitals and hotels will augment the industry land scape. The U.S. electric water heater market was valued over USD 800 million in 2017. Extreme climatic conditions along with growing consumer needs for reliable hot water supply will enhance the industry outlook. In addition, rising adoption of district and space heating systems coupled with advent of digital heating technologies will further augment the business landscape. Stringent environment regulation along with ongoing measures by industry players to limit their carbon footprint will accelerate the Europe water heater market growth. Defined product standards and codes by respective authorities along with government regulations toward energy efficiency will augment the industry outlook. In 2013, European commission developed eco-design and energy labeling requirements which direct the manufacturers and suppliers to indicate the efficiency class information on the labels. Key participants across the electric water heater market comprises A.O Smith, Bosch Thermotechnology, Rinnai Corporation, Bradford White, State Industries, Saudi Ceramics, Rheem Manufacturing, Ferroli, Haier Electronics, Linuo Ritter, Jaquar, Whirlpool, Hubbell, Ariston Thermo, Kanch Water Heaters, Viessmann Group and Vaillant Group. Low cost manufacturing and product differentiation are the key business expansion strategies adopted across the industry. Furthermore, acquisitions & mergers coupled with collaboration with technology providers will further strengthen their position in the market.